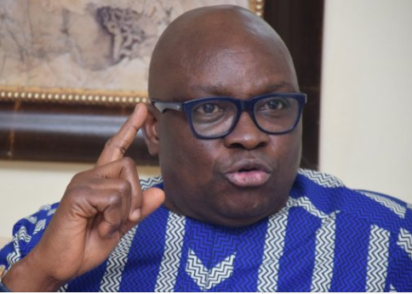 Outgoing governor of Ekiti State, Mr Ayodele Fayose, says he has been vindicated about his 2015 warning that President Muhammadu Buhari lacks capacity to govern the country. He spoke this in Ado Ekiti when a former governor of Kano State, Senator Rabiu Kwankwaso, met with the state delegates to ask for their support for his presidential ambition. According to Fayose, when he made the warning, Kwankwaso was one of the people who reacted angrily against him. “But thank God, today, you have seen reason and you are now born again”, he said. He urged the Peoples Democratic Party (PDP) to pick the best candidate so that Nigerians could have a choice in 2019. The governor said that he dropped the ambition because of the alleged stealing of the mandate freely given to his deputy, Prof Kolapo Olusola, by the people to succeed him. In his remarks, Kwankwaso admitted that the APC, which he was part of, made a mistake in their change mantra by picking Buhari. In a related development, another presidential aspirant of the party and former Minister, Kashim Saminu Turaki who was in the state to canvass for support of the delegates, warned that the unity of the country was under great threat.